A shelter in place was ordered as smoke rose from the petrochemical fire in Deer Park, Texas, starting on Sunday and continued through Wednesday. A fire at a petrochemical terminal outside of Houston is now out, four days after the blaze broke out. The fire started Sunday morning at Intercontinental Terminals Company in Deer Park, about 15 miles southeast of Houston, and continued to burn until early Wednesday morning when officials declared the fire out. Deer Park officials issued a shelter-in-place directive after the fire was reported. The cause of the fire remains uncertain at this time. Harris County officials say the fire started at the terminal that stores petrochemical liquids and gases, including fuel oil and bunker oil. The company’s website says the terminal has a storage capacity of 13.1 million barrels. The tanks that are burning contain gasoline blends, base oils, xylene, pyrolysis gasoline and naptha, officials said. 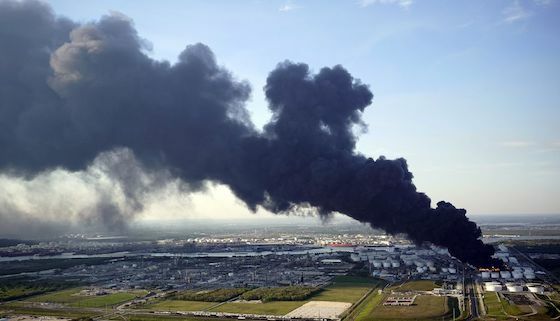 As a towering plume of black smoke billowed a mile above Houston for a third day, local authorities keep telling residents the thick black smoke from the petrochem facility isn’t a threat to public health. Firefighters suppressed a fraction of the blaze in the tanks captured by fire at Intercontinental Terminals Co.’s suburban Houston storage facility, officials said Tuesday. Pollution monitors continued to show the air is safe to breathe, probably because the intensity of the fire is pushing the thick plume high into the atmosphere, said Jeff Lindner, a meteorologist with Harris County’s flood control agency. Seven tanks holding gasoline ingredients fell victim to the fire. “Fuel has burned off and we’ve said from the beginning that may be what has to happen,” said Laurie Christensen, Harris County’s fire marshal. Christensen said the county fire marshal’s office will begin its investigation when the fire is out. Attention turned Tuesday to a 4-feet-high (1.2-meter) concrete wall lining the south side of Intercontinental’s property that firefighters were watching to ensure it isn’t breached by foam, water and other runoff. The water is knee deep now and will become a bigger threat if it reaches chest deep, according to ITC executives. Intercontinental’s facility in Deer Park has 242 tanks located near the Houston Ship Channel, a primary port of call in the Gulf Coast industrial nexus that supplies much of the world’s fuel, chemicals and plastics. The town has a population of 32,000.